First, I apologize for the limited posts this weekend. I'll be back to normal this week I hope. Obviously I've been busy getting everything moved over here to the new site. By now I'm sure you've noticed the new Third Jersey Central section. When it's done, that page and this blog will be all you'll need to stay updated on all the new third jerseys. You can see complete news archives for each team as well as comprehensive photo galleries of said jerseys. It's currently a work in progress so keep checking back as I add more content. Second, I've added RSS feeds for those of you interested. You can find them in the Tools section of the sidebar. And by the way, the way this system is set up with the new site, it's not easy for me to read all the comments that get posted. So if you have a question or comment you want me to see, I highly suggest email as that's probably the only way you can be sure I'll read it. The Chicago Blackhawks have finally made a reference however small to the debut of their new third jersey. They'll hit the ice in the presumably black sweater tomorrow night when they face the Colorado Avalanche. The Hawks have posted a schedule on their web site indicating the 11 games in which they plan to don the new threads. Four of them will be on the road, including their visit to the Sunshine State in February. For the record, I haven't seen anything else on their web site indicative of a third jersey. The Dallas Stars currently have an ad on their web site promoting their 2008-09 Dr. Pepper Luncheon on Tuesday, November 18. It's expected that the Stars will use this opportunity to launch their new third jersey but the ad makes no specific mention of this. I'll keep an eye out for more information on this subject but I do believe we will see the new sweater on that date. The Carolina Hurricanes are schedule to wear their third jersey for the second time this season tonight when they face Toronto. I don't know if the Maple Leafs are also planning on wearing their alternate as they did last night against the Rangers. Speaking of third jersey schedules, I'm keeping track of when teams are wearing their them and when they're scheduled to. I'm hoping to make that available soon. Because I'm a geek, I'm also keeping track of how often teams win wearing their third jersey. For the record, third jerseys are 4-4 so far this season. One more thing before I go. I mentioned the other day that the Reading Royals and Cincinnati Cyclones were dressing up as their NHL affiliates on Halloween for Hockey Night in Canada in Reading. 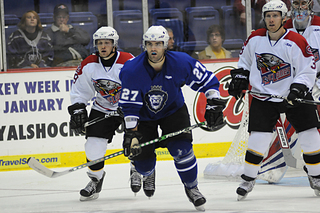 The Royals were kind enough to send me pictures from the game on behalf of Purdon House of Photography. Thought that was kind of cool. I'm happy to see minor league teams taking advantage of special one-time jerseys but I'm even happier it isn't a practice in the NHL. That's all for now. Be sure to stop by Third Jersey Central!